Im using Cryptomator in a automated backup process since version 1.3.4 which follows 3 steps. Since Version 1.4.5/6 I notice a really strange behavior that actually avoids my backup process to start. When cryptomator is launched, the vault is opened and mounted. But the drive is not available or mounted, not visible in the windows explorer. And then the update check is running, and the app seems stuck in it. You can see, the vault is shown open (but its not), and the update check is shown running (but the progress wheel is not turning). I thought the update check is having problems so deactivated it. But, that does not help. The app is stuck at the same position, but without the update message. In my case, after 30 seconds the backup program is interrupted with the message that the drive is not available, because the drive is not available. After that message, the drive is available immediately. Furthermore, If I restart the process, the cryptomator is opened once again in a second instance and tries to open the same vaults. You can also start cryptomator in several sessions now. That was not possible with the older versions, and Im not sure if this is intended, because it just don’t make sense to me to have multiple cryptomator sessions at once. So there is no workaround/solution for me and I have to do my backup-process step by step manually. I’m curious whats going on here and why we are allowed to open cryptomator more than once now. 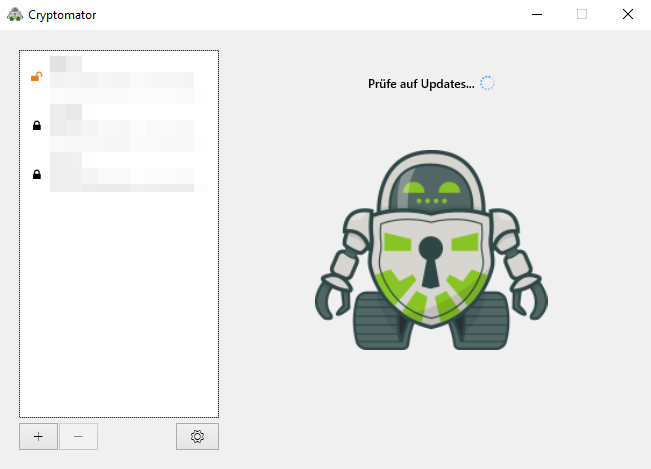 Cryptomator being “stuck” after startup is a weird behavior because you’ve mentioned that this does not happen if you start the application manually. How does the automation (a script?) start Cryptomator? In 1.4.6, we’ve simplified the launcher (incl. its IPC parts). I think this could be a bug that multiple sessions can be opened at once, we’ll check that. Let’s focus on WebDAV first. Is it possible that when starting Cryptomator automatically, it is executed with a different user? What is the output of net use to list all currently mounted drives? 1st of all: thank you for your support. How does the automation (a script?) start Cryptomator? I can configure in my backup solution (Personal Backup) to run a file before and after the actual backup process. There I entered the path to cryptomator. I only have 1 User on my system, and he is the admin. I opened cryptomator “the normal way” and via the backup tool and checked which user runs the cryptomator process. Both ways the same user. But the same user was running cryptomator and there was no effect on my issue. I checked the log file at the point when cryptomator “stucks”. To be honest, I’m out of ideas what makes a difference between launching Cryptomator manually vs. via some other program or script. Neither can I explain why the UI is stuck, nor why net use exits successfully but doesn’t mount anything. Mhm. Ok. I will keep an eye on that and will report if there’s any change during the next updates. Today I wanted to try something else. Why not writing a batch that starts cryptomator.exe and waits for a couple of seconds, and then let Personal Backup call the batch instead of the cryptomator.exe directly. cryptomator showed up nearly immediately and the volume was available also in less than 2 secondes. I am really confused about this behavior when calling cryptomator.exe via a script or external program. If anyone has an idea where I can dig also, Im happy for every hint. I will continue my investigation and report. When I let personal backup call the batch, the behavior is like it was when calling the cryptomator.exe. This is actually a desirable behaviour that I failed to achieve in other places. During debugging sessions I like to start Cryptomator via command line to see anything written to stdout, but on Windows it usually just triggers the launcher and returns immediately (other than on Mac/Linux). So apparently the launcher is able to distinguish if it is in a script environment or started manually. But neither do we know how to influence it nor how to make use of this capability.